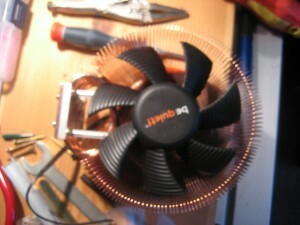 I recently upgraded the CPU cooler in my main desktop from the standard one included by Intel to a Zalman CNPS9700 LED. While I was impressed with the build quality and cooling capacity, I was disapointed that the included fan controller was manual, not only adding cables and controls inside my computer, but leaving it up to me to remember to turn the fan up when carrying out some intensive computing task. 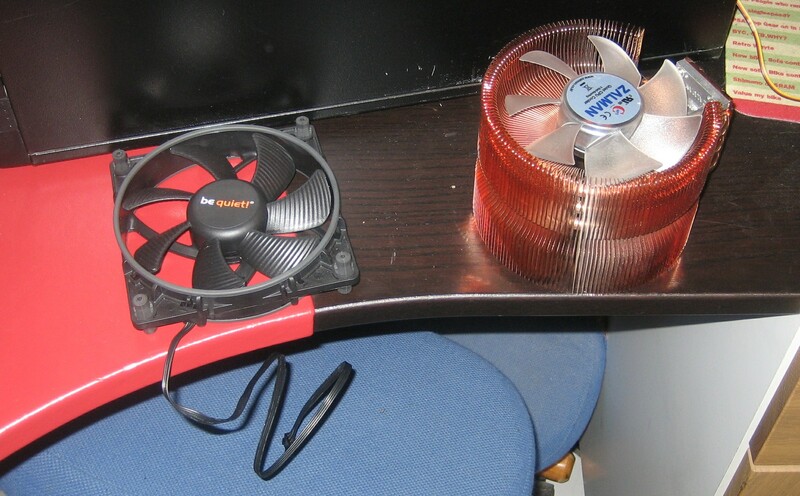 This struck me as silly when the motherboard comes with a PWM controller to adjust the speed of fans. After reading the documentation, I concluded that the 110mm fan it was supplied with was probably the dimensions of a standard 120mm case fan with the square frame. Unfortunately this was incorrect, having ordered a variable speed 120mm fan, I found it to be too big to fit in the cooler. CPU cooler and replacement fan seen side by side. After sitting on my desk for some time, bugging me, I decided that the time had come to try out my friend’s new CNC machine that he had been itching to put to use. 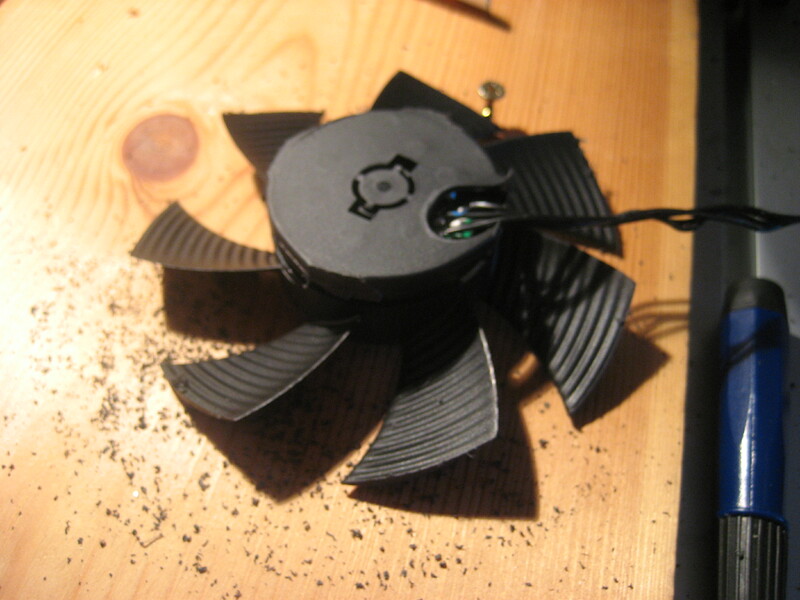 I had initially planned to fix the fan and secure the fan blades, before cutting a path on the end of a blade, rotating the fan to the next blade and repeating the path. 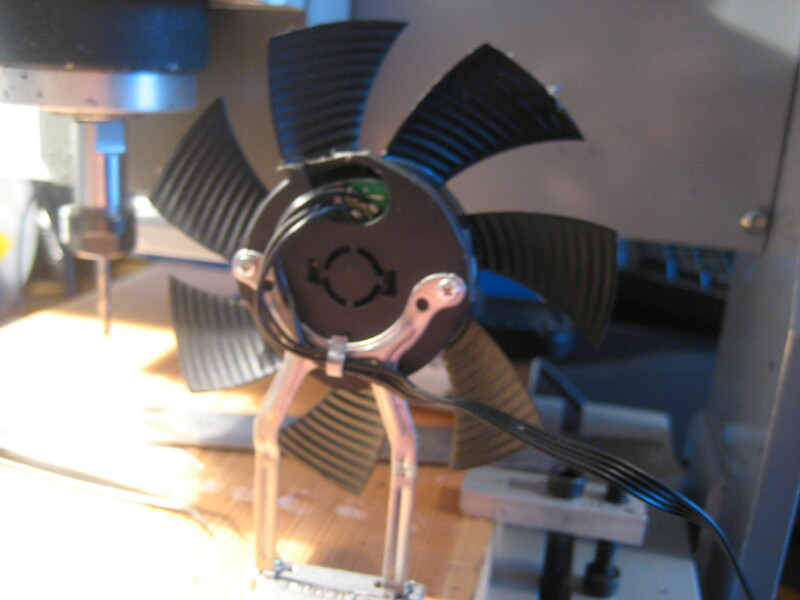 However the play in the fan meant that I was not confident about getting the blades balanced correctly. Instead we decided to use the machine as a much more simple milling machine, rotating the fan manually past the cutter to ensure that the blades ended up even. Starting to cut the blades. Once the fan blades were fully trimmed to the correct size, the next job was to remove the fan and hub from its square frame to fit into the cooler. Fixing the fan into the cooler was not an entirely straightforward process, as the existing fan was screwed to a thin flexible bracket which then mounted to the cooler’s base. It was necessary to extract this bracket and then to mark and drill the back of the new fan for the small screws at the correct spacing (40mm) to attach the bracket. New fan attached to the bracket which holds it in the cooler. Anyone else trying this should be aware that it’s a lot easier to disconnect the two halves of the base of the cooler than it is to get to the awkward screws that hold the bottom of the bracket to the cooler. The heatpipes seem to be firmly attached to the bottom, copper half of the cooler’s base. Cooler reassembled with the new fan in place. 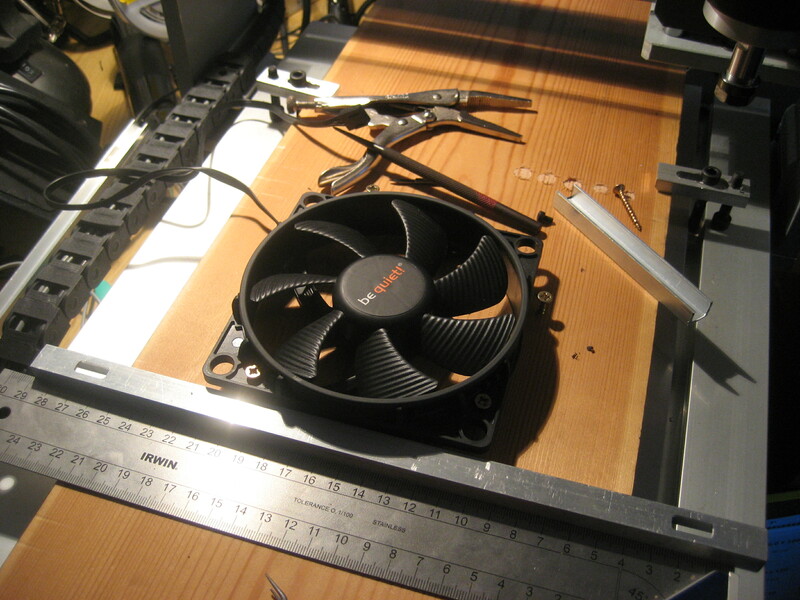 Once the cooler was back together I found that the thin bracket was a great advantage as a little work with pliers was all it took to make sure that the fan was aligned well and didn’t rub at any point. It was then simply a case of putting it back into my PC with some fresh thermal paste and making sure that everything worked OK. Despite the motherboard initially reporting a fan fault as the fan was going so slowly, everything seems to be in order. After a little setting up, my system idles with the CPU at 30°C with the fan going round at a practically silent 450 RPM. 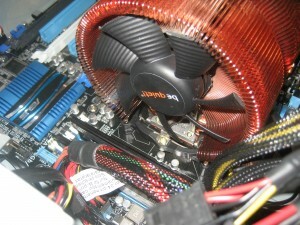 Under load, the fan is ramping up to around 1000RPM with the CPU cores hitting between 50°C and 55°C, at which point you can just hear the fan with the case open – with the cover on it’s considerably quieter than the hard drive noise. 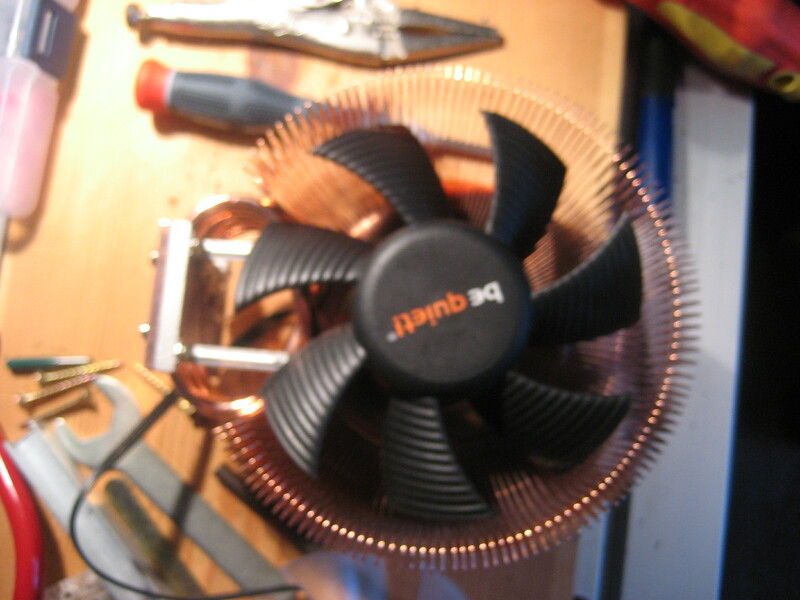 Overall I’m very happy, an extra £10 fan has made this cooler pretty much perfect. Nice work. 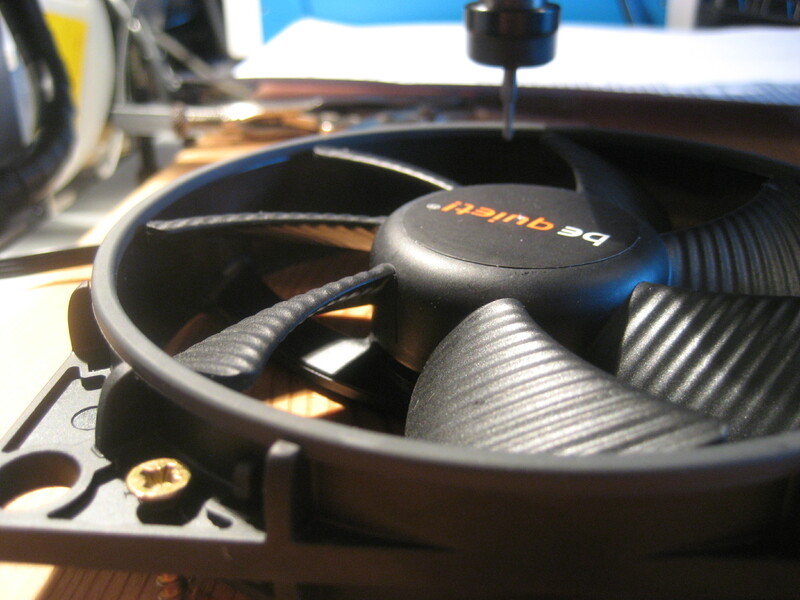 In case you still use this fan in a spare rig somewhere, you should know that you can order replacement fans directly from Zalman. 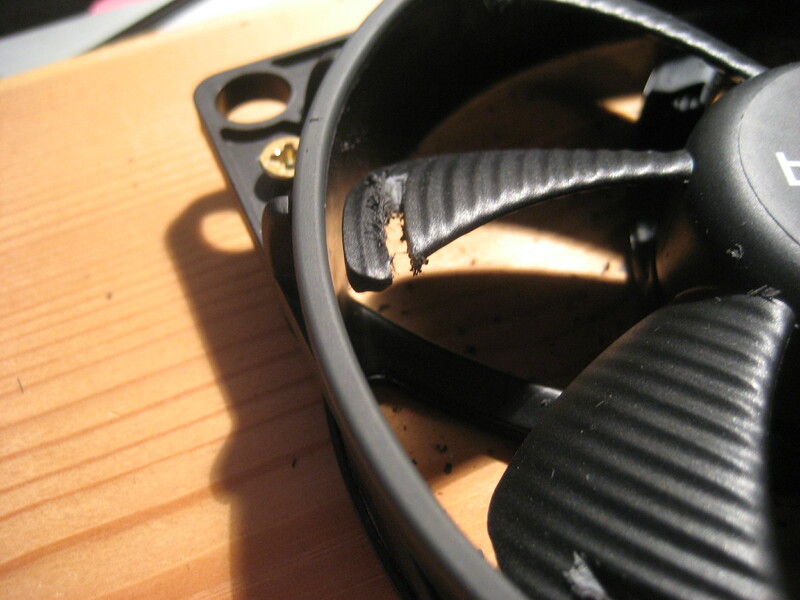 I had to replace my fan in 2010 after re-lubricating the bearings only worked for a few more weeks. Fast forward about 4 years later and the replacement is starting to get noisy. I was still able to order a replacement fan just yesterday. All I had to do was fill out their support form on their site. The first time the fan was free, but the second I just got was $2.50 plus $2.50 shipping. A small price to fan to keep this beautiful cooler going; especially considering I bought it in early 2007, over 8 years ago now! « HOWTO: Using Intel’s RST with Linux.